Living a Fit and Full Life: Infanttech's Smarttemp Bluetooth Thermometer is the New High Tech Way to Track Your Child’s Temperature! Infanttech's Smarttemp Bluetooth Thermometer is the New High Tech Way to Track Your Child’s Temperature! The Zooby Car and Home video baby monitor is the inaugural product in the infanttech family. This monitor is the only one on the market that truly gives parents the ability to keep their eyes on their most precious cargo at all times. Rather than be constrained by the traditional video monitor that adheres permanently to the bedroom wall, the Zooby Car and home Video baby monitor was designed from the ground up to allow parents to take it with them anywhere. Even in the car. Place Once. No Fuss. Just Smart! When Fever strikes, Infanttech's new Smarttemp Bluetooth Thermometer provides parents a new high tech way to track your child’s temperature through your smartphone. 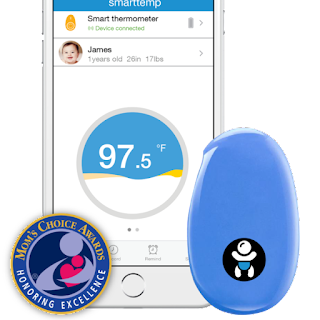 Using Bluetooth technology, Smarttemp is a smart thermometer designed for children where a parent can track body temperature continuously in real time through their smartphone. A parent can keep baby close, but not disturb them when checking their temperature. Using a traditional digital thermometer requires parents to frequently monitor their children’s temperature manually, and especially at night. This often comes with stress, sleeplessness and exhaustion to parents and often causes the babies to feel uncomfortable and resistant. Finally, an easier solution. When Fever strikes, infanttech’s new smarttemp provides parents a new high tech way to track your child’s temperature through your smartphone. Using Bluetooth technology, a parent can keep baby close, but not disturb them when checking their temperature. Using a traditional digital thermometer requires parents to frequently monitor their children’s temperature manually, and especially at night. This often comes with stress, sleeplessness and exhaustion to parents and often causes the babies to feel uncomfortable and resistant. Here’s an easier solution. Get alerts when the temperature rises beyond the threshold and Receive medicine reminders when it’s time for another dosage. Easy placement underarm with adhesive pad (included). Can be used for up to 24 hours at a time and is not a one time use. Smarttemp is easy to use. Simply download the smartphone app, place the thermometer under baby’s underarm with adhesive pad (included), and monitor your baby’s temperature. Smarttemp comes with the thermometer, a carrying case, 10 adhesive pads, and has up to a 3 year battery life with no charging required. Infanttech's Smarttemp Bluetooth Thermometer is wonderful! My one year old just got over one heck of a nasty little virus and I can't even begin to tell you how amazing it was to have Infanttech's Smarttemp Bluetooth Thermometer on hand. Infanttech's Smarttemp Bluetooth Thermometer is incredibly simple to use. Simply download the smartphone app, place the thermometer under baby’s underarm with adhesive pad, and monitor your baby’s temperature. Being able to monitor my son's temperature and get alerts via my smartphone during the night was a complete blessing. I was alerted twice during the night and was able to give him medicine to bring his temperature down. I was also able to track his temperature via the temperature graph. My son's doctor was quite impressed and loved being able to see all that info at his appointment. Sleeping when my kids are sick is always stressful because I wake up multiple times to check them and monitor their temperature throughout the night so having Infanttech's Smarttemp Bluetooth Thermometer also helped me sleep since I knew I'd be alerted if the temp got too high. Sleeping isn't easy when you have a sick kiddo, so anything that helps is definitely worth it in my opinion. I highly recommend Infanttech's Smarttemp Bluetooth Thermometer! Click HERE to learn more about Infanttech! Follow Infanttech on social media!